Almost 135,000 South Australian homeowners and retirement village residents on low or fixed incomes will start receiving the State Government’s Cost of Living Concession from the beginning of September. The payment of up to $202.70 will be made directly into bank accounts to help with expenses such as utilities and council rates. Eligible South Australians homeowners who received the concession last year will automatically receive the 2017 payment, which has been indexed to increase each year in line with the Consumer Price Index. Eligible tenanted households will receive a $101.40 payment in February 2018. Eligible households who have not applied for the Cost of Living Concession, or who previously received the concession but have not provided their banking details, are encouraged to call the ConcessionsSA hotline on 1800 307 758. 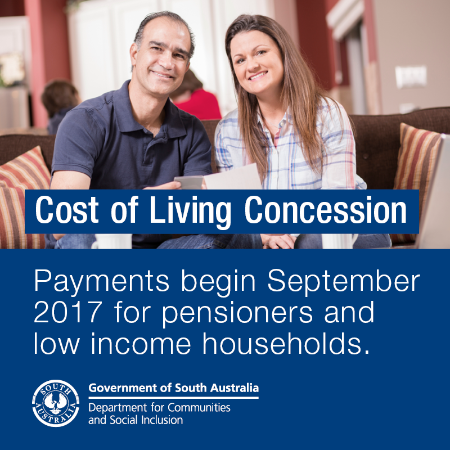 Applications for the 2017-18 Cost of Living Concession close on 31 October 2017.